Knowing what to do during an emergency can and will easily overload your senses. The best thing to do is to take classes ahead of an emergency, and continue to practice them in a non-threatening environment. Just thinking about what you can do is the first step. Then contact Home Hazard Prevention to sign up for any of their classroom or individual training sessions. HHP now offers CPR Training Near Me! Meaning we offer CPR to just about everyone at just about every location in/near Maricopa County, Arizona. CPR Training at your house is available today! Many of the things that we encounter on a daily basis can become a life threatening event if we are not properly prepared and ready to take action. This includes using common sense and being cognizant of your surroundings, but some times that is not enough. Be prepared to offer help by getting trained and being confident on your skills. This training is offered around the Valley. Since we offer mobile CPR Training, at a time and location of your choosing, you can rest assured that you’ll never miss a ‘class’. Firefighter led CPR Training, call 480-719-1551. Group discounts are available, just ask! CPR Training Near Me means that you never have to leave home! The American Heart Association recently quadrupled the prices of their CPR cards. AHA courses may have an additional card fee, which goes directly to the AHA and not HHP. Travel distances greater than 20 miles will incur a $10 gas fee for groups of 1 to 3 attendees. No fee for groups of 4+ attendees. We can help you do all of that, and more, with any of our CPR & First Aid Classes. These are stand alone classes, but your family also gets one-on-one education with the purchase of your home safety inspection, complete with all of the training listed here, PLUS a fire extinguisher! 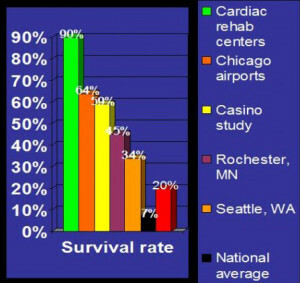 Why is early CPR and Defibrillation so important?